TNW Academy partners with Teachable to bring you top-quality online courses. In this new series, we take a look behind the scenes at the life of a course creator. Creating online courses for a living maybe not be a career you’ve ever considered, but it can be really rewarding. You get to be creative, share your knowledge with the world and help other people grow their own skillsets. You can also earn a good living from it. 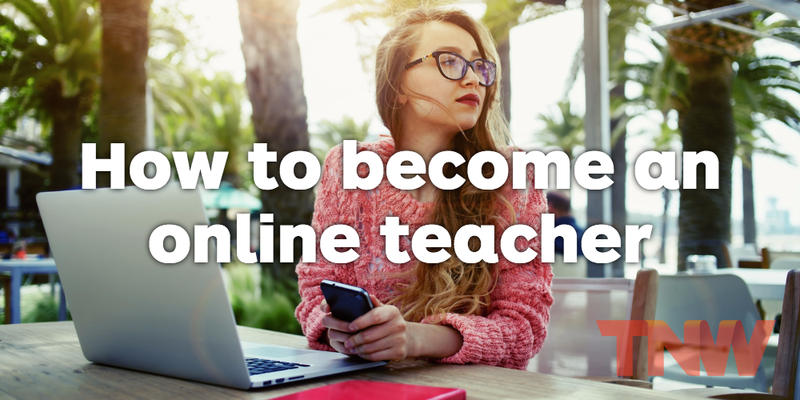 When I first met Teachable (previously Fedora) co-founder Conrad Wadowski, he introduced himself as someone who had made over $50,000 in one month with an online course – I ended up joining the company. To help you pursue this rewarding lifestyle, we at Teachable have put together a course on how to create courses (#meta), I offered to go through it myself with our first group of digital pioneers. For me, a huge focus will be empowering other women to take advantage of this technology. I want to see women leaning into this platform in the same way I see men. Not that we don’t have some badass female course creators on our platform, we do, but I want more! With this in mind, I’ve been working on a pet project of my own. I have to be honest, it’s changed things for me. The other day, riding home on a packed subway, I was daydreaming about my course. While I don’t want to spoil my idea before it’s nailed down, I imagined it coming to life. My heart rate went up. My palms started sweating. I’m pretty sure my pupils dilated because the other commuters were looking at me like I was crazy. The idea of actually pushing my content in the world was terrifying. What if my design came out lacklustre? What if my idea isn’t interesting? What if I send this course into the world, put myself out there, it fails and my reputation is ruined forever by Twitter trolls? They simply don’t know how to create a course or build and launch a product. I personally interviewed Jon Haws, a licensed nurse with a course on NCLEX prep. He was so terrified to launch his course and get complaints that he made a list of compliments from students to turn to when negative feedback flowed in. However, Jon never received the negative comments he was expecting. In reality, he hit publish and and was flooded with positive reviews. Acknowledging this information and knowing, cerebrally, what course creation methods work was great, but that didn’t stop my stomach from doing more flips than Nadia Comaneci. So I came to a conclusion. I needed to start doing a few things to manage my own psychology. Since I was worried about a lot of real and not-so-real real threats, I sat down, defined them and started to dispel them. I looked to a few online resources and plain hard data about launching courses. To attack the idea, I started to do some tough research into what my potential audience was saying online and, with painstaking detail, charted audience complaints from discussion boards so I could focus in on my idea. Then, like the extrovert that I am, I started talking to the people around me about the idea of an expert. I’m lucky enough to work with a very inspiring CEO who has opinions…lots of opinions on this topic. In the words of Teachable’s CEO, Ankur Nagpal, an expert is just one step ahead of you. While we’d like to think an expert is the most qualified person to teach a subject, an expert is often bogged down by intricate details and forgets about the issues a true novice and student has. What Ankur said paired nicely with what I’ve read on blogs and in books about women in business. There’s a confidence gap. If dudes have fears about launching a course and not believing they’re qualified, I believe that those fears are intensified for women who are culturally taught to be less assertive and less confident (all the things it takes to launch a course into the world). That’s when I decided, at some point, you’ve just gotta ship it. That’s a common among developers when they push a new piece of code. Programmers don’t hoard away lines of code on their hard drive, afraid to hit send, THEY SHIP IT. As a writer and content producer, I see no reason why I can’t adopt this mentality too. Which is why, over the next few weeks, I’ll be blogging about my journey. My sole purpose is to share my own personal experience and the struggles and fears I face as I launch a course and online business. I hope my words hit home for other course creators and other entrepreneurs and make it a bit easier to tackle your online project. Considering the adrenaline rush I get everytime I hit send on Mailchimp, this is about to be an adventure. Look out for part two of this series here on The Next Web soon.